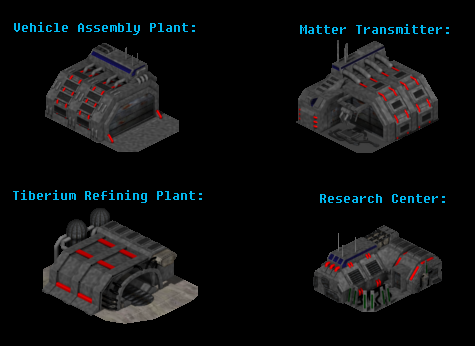 Research Center, but Vehicle Assembler needs still some more work and Refining Plant even more so. I'd like to get your opinions on them so far, what to improve etc. before making shp's out of them . 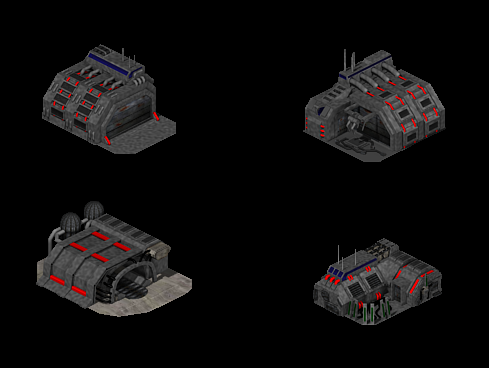 All buildings made by [TiberianPast]! Definitely an improvement compared to your earlier buildings, TP, good job. Other than the structure bases I think they look nice. I like them, but the 2 buildings on the left don't have a good looking foundation. The other 2 are good. Very good work, but I have to agree that they look a little blurry. Can we possible see these ingame? No. It was set as area. Looks like I still have lots of work to do with them. They look nice, but really, set it to Catmull-Rom. Really, it helps a lot. Thanks. buildings looks now much better, I think. Very nice. You're improving rapidly. Sadly, this topic is three years old so I doubt they'll get a good sharpening any time soon.